TOKYO (KYODO) - Japanese farmers expressed concern Wednesday about an expected influx of imports and other effects of a trans-Pacific free trade agreement led by Japan that is set to enter into force on Dec 30. Australia said earlier in the day it has become the sixth nation to ratify the Comprehensive and Progressive Agreement for Trans-Pacific Partnership, fulfilling the requirements for the 11-member tariff-cutting framework to take effect. Reaching the required number of states to have ratified the deal occurred "rather fast," said 60-year-old Tatsumi Dejima, who runs a farm in the village of Sarabetsu in Hokkaido, known for producing half of Japan’s raw milk. "If cheap dairy products start coming in from overseas, consumers will probably choose the imports. I fear it would be too late if countermeasures are taken after we start to be affected," he said. Japan, the leading economy in the deal, is one of the five other countries to have ratified it, along with Mexico, Singapore, New Zealand and Canada. The members yet to finish domestic procedures are Brunei, Chile, Malaysia, Peru and Vietnam. In the southwestern prefecture of Kagoshima, which raises the largest number of pigs in Japan, Michio Ushidome, the head of an association of black-pig producers, expressed doubts about the touted benefits of the pact. "Small farmers like us are unlikely to enjoy benefits from it," he said, adding he hopes the rift between the pact’s signatories and the United States, which pulled out of the framework in 2017, would not grow to affect exports of Japanese farm products. "We want (the government) to make sure it takes support measures if pig-farming businesses begin to feel the crunch," Ushidome said. Other farmers, including rice producer Mitsuo Ota in Daisen, Akita Prefecture, also worry about lower tariffs. "It is something the government decided in consideration of the country’s trade overall. No matter how much we farmers oppose it, we have to follow the decision in the end," said Ota. Japan’s business sector, in contrast, welcomed the pact’s expected entry into force. "It is an enormous achievement. We, as corporate managers, very much welcome the move," said Hiroaki Nakanishi, chairman of Japan’s largest business lobby the Japan Business Federation, commonly known as Keidanren. 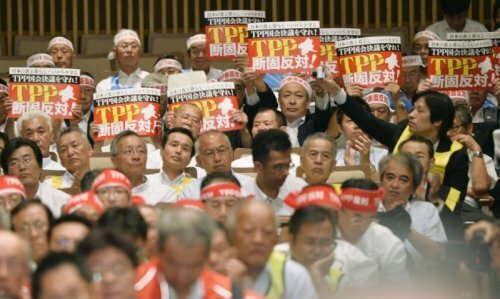 Nakanishi said that even though he can understand the reasons behind the United States’ withdrawal from the framework, Japan needs to promote free trade deals. "People should understand each country has its own circumstances to consider," Nakanishi said.